After studying for a time at the American College in Paris (where she also studied mime with the ex-wife of Marcel Marceau! ), she taught French for a while and then, in her 30s, began taking art classes at Marylhurst University and, after moving to Seattle, at the University of Washington. Krieg’s prints start with an original digital or analog photograph, which she may manipulate via computer, erasing a background here or oomphing up the frame’s texture there. From this work she generates a 4 by 5 negative, which she often embellishes with photo oils and inks. “When I’m painting on a negative it feels like creating memory—accessing the collective unconscious,” she says. Saloming (above) started with a photograph Krieg took of the funeral casket of Alexander the Great when she visited a museum in Istanbul shortly after 9-11. She colorized and textured the “pretty straightforward” shot in the computer, then used oils to create the landscape that anchors the bottom of the frame. “The photograph is beyond Istanbul,” she says. “Saloming is an archtype for me of the way horses are. Their power. Their strength. Their mystery. Their hold over the human psyche. 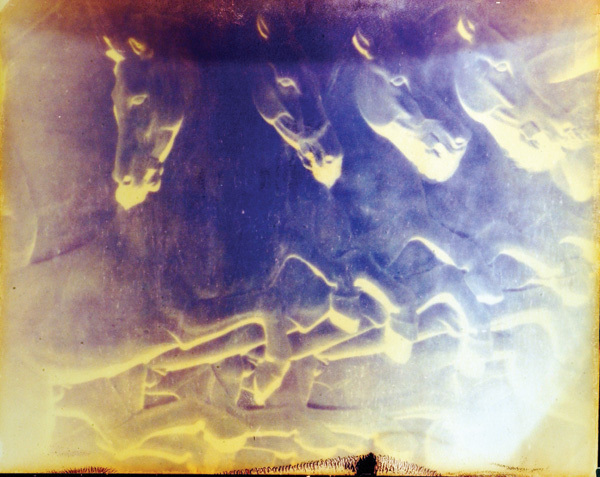 Some people are afraid of horses and some people, like me, can’t live without them.” Saloming, a 30 by 40 Fuji crystal archive print, sells for $2,500. Contact artist Carolyn Krieg via her website, carolynkrieg.com .